The parish registers, maintained by the church, recorded baptisms, marriages and burials. Bedfordshire County Council transcribed the registers from 1602 to 1812, and published them. Copies exist at Bedford library. Work is ongoing to present the data from the published registers in a much more usable form. For now, this is a first attempt. The copyright issue is obscure. Just how much do I have to change the original work before it becomes an original work in its own right? I have carefully not published direct copies of the original printed books, these pages are based upon the data contained in the books, but they are not copies. The parish registers were required to be recorded by the rector and churchwardens, and had to be kept in the church, as explained in this wikipedia article. A copy, the Bishop’s Transcript, was sent regularly to the bishop. This duplication of the data has helped reconstruct it even if some has been lost. In all of the data presented on these pages, “PT” means the printed transcription, the copy of the registers published 1970-1990 by Bedfordshire County Council. “B.T.”, used occasionally, menas the Bishop’s transcript. The printed transcript doesn’t look like an exact letter-for-letter transcription at all. In particular, it has numerous alternate names for people added in [square brackets] or occasionally (round ones). Quite what these mean is still a mystery. Quite a lot of liberties have been taken with the PT to turn it into usable tables of consistent data. A very few entries – much less than one percent – have had to have data altered to fit into the spreadsheets. For example, for a few entries, the day of the month of the event was missing, so was arbitrarily set to the first Sunday. usually, the “notes” section of the spreadsheet data explains this. If in doubt, Bedford library has copies of the printed transcript, or (I have just discovered) the Bedford Archive Service sells copies of the books. The archive service presumably has the original records, although I have not seen those. Dates recorded in the registers use first the Julian Calendar, then later the Gregorian Calendar. Britain switched from Julian to Gregorian calendars on Wednesday 2 September 1752 (Julian), which was followed by Thursday 14 September 1752 (Gregorian). The Julian calendar has new year start on March 25th, so 24 Mar 1700 was followed by 25 Mar 1701. This is all very confusing! I added Gregorian-equivalent dates for all events, which makes it much more practical to compute day-of-week and to measure the time between two events. A Good Day for a Baptism? (Click for a bigger version). 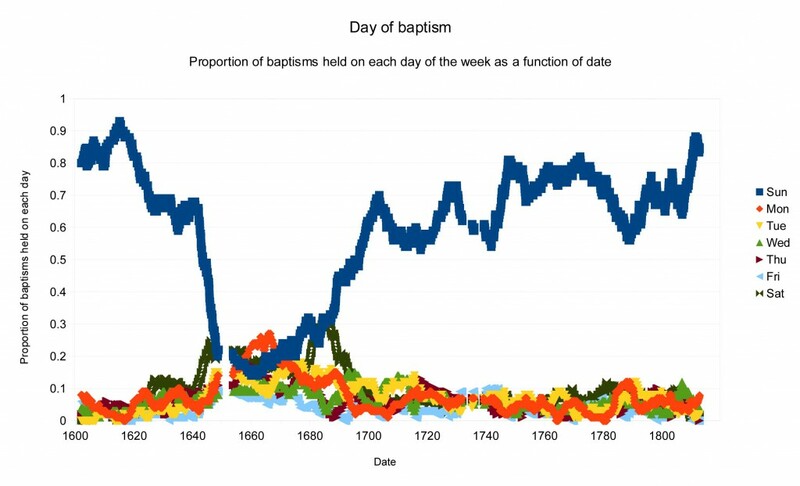 Around 1600, Sunday was by far the most popular day for a baptism. Suddenly, just after 1640, the proportion of baptisms on Sunday fell precipitously, and a baptism was as likely to be held on any day of the week. This held true until about 1670, when Sunday started regaining its popularity, but it took until about 1695 before half of baptisms were held on a Sunday again. The English civil war started in 1642. Did people go to church every day then? Were they ordered to? If any historian knows the background to this intriguing data, then please leave a comment below! I do see there is comment about this in “Family History Revisited” by Wall, Hareven and Ehmer, because Google presents some content (but not all) here. Who were John and Elizabeth Niggerson, 1792? And who was Champeroon Major, married first to Sarah and later to Dinah around the same time? Champeroon is a vanishingly rare word. Did Dinah marry richard Evans later?